It's a sweltering afternoon and on a quiet London side street, outside an impossibly chic bakery (it's where Meghan and Harry had their wedding cake made), academic, author and former-model Emma Dabiri is taking a well-earned break from working on the final manuscript for her forthcoming book: Don't Touch My Hair. Before we meet I half considered this a slightly redundant admonition for polite society - why would anyone, bar someone with latent Harvey Weinstein tendencies, touch a woman's hair unbidden? - but, in person, you can see where the temptation might arise. In this most genteel of settings, Emma's hair is an event, a happening, a lustrously-beautiful nimbus that frames her fine features. Curiosity and generations of cultural racism seem to spur the urge to pet it, stroke it. I heroically resist, but others are not so strong. "A few weeks ago a woman reached out to touch my hair on the tube and as she put out her hand she said 'wait… you don't like that, do you?' It was as though some dim memory of editorials she'd read somewhere, came bursting through; she remembered and held herself back a bit." Growing up in Dublin, it happened all the time. It was constant. Often kids would just say "oh my God, look at her hair, it's mad" and come right over and have a feel and a chat", she recalls. "It felt strange and objectifying. I found it strange because I wouldn't even touch someone's dog without asking them. I never questioned all of the treatments (that are used to 'relax' black hair) but they weren't always available to me because it's difficult to get those products in Ireland. My mum would work in Liverpool or Manchester, and there you could get a curly perm, which is sort of like defined curls, rather than afro hair. "When I was about 14, I was at Wesley disco and across the dance floor I saw what seemed like a mirage - another black girl. So I ran across the floor and introduced myself and asked her about her hair, and after that her mum started braiding my hair and that sort of saw me through." Emma was born in America, but moved from Atlanta, Georgia, to Ireland with her Nigerian father and Irish mother when she was a small child. In a Dublin in which Phil Lynott and Kevin Sharkey seemed like the only two black people, her difference was conspicuous. "It was a huge shock to the system coming from sunny Atlanta suburbs, in the early 1980s. It was like going from colour to black-and-white - I lived in Rialto. In no uncertain terms I was made aware of my difference. Ireland was a very socially conservative country at the time. There was such homogeneity, generally, that people just didn't have a frame of reference. There was an inherited racism from America and England that didn't have to go into action very often." So acutely was she aware of her difference that, with her mother's blessing, she skipped out on her Holy Communion to write a treatise on slavery. The stereotyping she experienced here came in various forms, but the one that irritated her the most was the presumption that in particular ways, she benefited from her difference. "I tried to say I had done nothing to set me apart as an object for scrutiny. "People often presumed I was a singer, or that I wanted to be one, and I love singing, but for years that turned me off. The presumptions were never that you were more intelligent, or could write; always that you wanted to do something in show business or to be an athlete." Irish boys had their own way of objectifying her. "They would say to me 'oh my God I've never been with a black girl' and it came with disturbing undertones about the presumed sexual licentiousness of black women." She was intensely interested in English and history, but not particularly academic otherwise, and bullying and other issues caused her to move schools several times. She names a string of private girls' schools she attended and says that the classism she experienced as a student from a working-class area sometimes blended with the low-key racism of the more well-heeled suburbs. "I was going to these posh girls' schools but then living in Rialto, with a single mum and this 'unknown' black dad - my dad went back to Nigeria when I was about 10. I remember one friend telling me that another friend's mother had given the group of girls a little pep talk as to why I was an inappropriate friend. I was hearing this when I was 14." Her parents split up when she was 10, but she says she didn't feel damaged by it. It would be five years, however, before she would see her father again. "I didn't see my dad again until I was around 15. He got back in contact then. My relationship with my dad was distant, but while a lot of people say that the break-up of parents was a defining feature in their life, I wouldn't say that was the case with me. There were other events that were much more formative." One of these was a stint she spent in Atlanta, where her father had gone to college and where she became enchanted with the culture. She wanted to follow in her father's footsteps but the prohibitive tuition fees stood in her way. "Moving to Atlanta to spend time with his family was a huge thing for me. I love it there. I got into university but couldn't afford to go because the tuition fees were so high so I ended up coming here, to London, which seemed like second best. It was a cool time to be here but I was disappointed about America. London was more diverse, but I really liked southern black American culture and it was such a vibrant time for the music coming out of there - crunk was huge. When I was in the States I was too young to go out and drink but I still had fun. My life has probably panned out very differently." About 10 years ago, her arresting good looks got her spotted on the street by a modelling agent. It led to a steady stream of work. "Name any brand drink and I've probably been in their ads. Kitchens, toothpaste," she recalls, almost ruefully. "I didn't really enjoy it but it was easy money. It seemed arbitrary to be able to make money from it. I joined an agency called the Eye. It all seemed so easy but also such a random, arbitrary way to be able to earn money." She wrote, constantly, in those years, but for herself, rather than for publication. She went to SOAS University of East London and did a degree in African studies and imperial studies, followed by a master's in violent conflict and development. "I was doing research on the Ghanian economy and how aid affects it," she recalls. "I became disillusioned with it: development as it was understood then, seemed like a sham to me, a continuation of colonialism. It seemed to me that the entities creating the poverty were western institutions." She moved back to London and got a teaching position at SOAS, where she also undertook a PhD. "When I started, my PhD coincided with the rise of social media, and so I started blogging bits and pieces that didn't make it into the PhD, and that became the Diaspora Diva (her Twitter handle). The second year of the Phd, I realised I was pregnant and I started blogging more then." Her partner, and the father of her son, is a music journalist but she tells me that she is wary of naming him because of the surprisingly large contingent of trolls who follow her online - Google her name and one of the first things that pops up is a man on a long, sinister video rant about her. She thinks that part of this is due to her steadily rising-profile - she has written columns for The Guardian and has a new episode of the BBC series Britain's Lost Masterpieces airing later this week - but that part of it is specific to England. "When I talk about race, I'm not even saying anything all that original - a lot of it is pretty conventional wisdom, but the reality is that a hell of a lot of people do not want to hear a black person talking about race. Here, there is a far bigger pool of people who'll say 'if you don't like it you can just F-off back to Africa'. I think my Irishness confuses and enrages them even further. I think being a woman is a big part of it. Men who talk about race would say that to me too. "The responses in Irish media are quite different, the broad reaction is 'I'm really sorry you experienced that and I hope things have changed'," she says. The retreating empire is a huge part of people's identities here, whereas Ireland, with its history of being colonised itself, there is a history of more empathy. That's part of the reason why, however long I've been away, I still feel so Irish." As for whether she feels 'more' Irish or Nigerian, "people often ask me that. To me, it's not a relevant question. First of all, I was born and raised in Ireland, but really I don't feel I have to choose. I identify as both black and Irish, it may be unusual - although happily increasingly less so - but the two are not mutually exclusive! "In fact, I feel very lucky to be from two such rich cultures. I am very proud of both. I certainly have had a complicated relationship with it and I definitely had to leave, in order to get a better sense of myself, to be somewhere else where I was just ordinary, where my race wasn't a constant point of note, but at the same time, in those environments, my Irishness made me different. "So it's been complicated, but I love Ireland. Dublin is integral to who I am. There exists something unquantifiably special about being Irish." Sinead's TED Talk Why Design Should Include Everyone racked up 1.2 million views online and Vogue recently named the Irish woman as one of the 25 most influential and aspirational female figures working in Britain. Dawe is an advocate for gender equality and the role of arts in society. 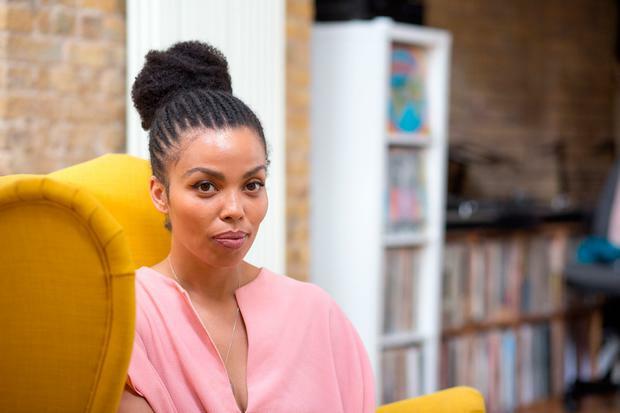 She has carried out research on 'Waking the Feminists' and is now working with the Abbey to develop a diversity and equality strategy for the National Theatre. As such she is one of the most interesting new feminist voices in Irish media.